Over the past month Virtual Orator has been taking part in a yearly competition in the Czech Republic, the “Idea of the Year” (Napad roku) competition. 197 startups/ideas entered. Top 30 and Top 12 cuts were made along the way. We are quite proud that Virtual Orator placed 10th! We were the only non Czech speaking group to place! In an ironic twist, my being a native English speaker was not an advantage in this competition. Usually, startups with founders from non English speaking countries have a bit of a disadvantage. English is often the defacto language of such competitions, and the high pressure short pitch is very challenging public speaking. Thankfully, I didn’t have to present in Czech. We definitely wouldn’t have placed in that case. I tend to speak to quickly. That coupled with the time constraint means I probably was talking way to fast. Considering non of the jury were not native English speakers, that probably wasn’t ideal. Like most people, my articulation also suffers when I rush and am stressed. Native speakers, particularly Americans, would do good to think about slowing down and articulation when they are public speaking. Since we made it through, I guess those hours of practice helped. The “Vodafone Napad roku 2017” (Idea of the Year) competition was held in the Czech Republic and included Slovak entries. One nice part about the competition was the speed, less than a month from application to award ceremony. Of course that timeline did cause bit of stress for everyone. 197 entered, a record. The first round was the Top 30. That was the ticket to get in to the first live pitch. I’m not a fan of the 3 minute pitch. It really comes down to who can sell the best, though that doesn’t explain how we got through because that isn’t my personal strong point. I practiced and honed as much as possible in the 5 days or so of prep time. From there the Top 12 was selected. Top 12 was another round of pitching to an expanded jury. This time a 5 min pitch. A bit more time, but still comes down to selling. Se also had an opportunity for some seminars and a mentoring session with a variety of subjects. Quite helpful. 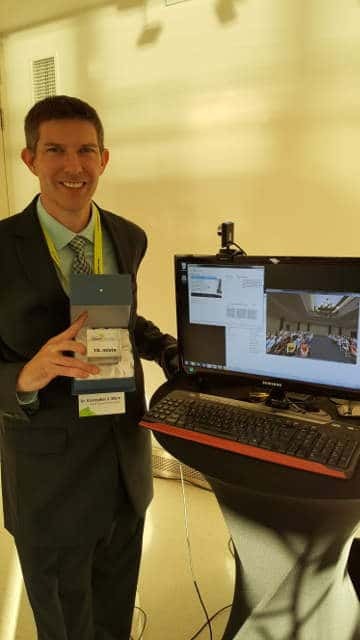 Finally, there was the award ceremony, where we had an opportunity to demo Virtual Orator. 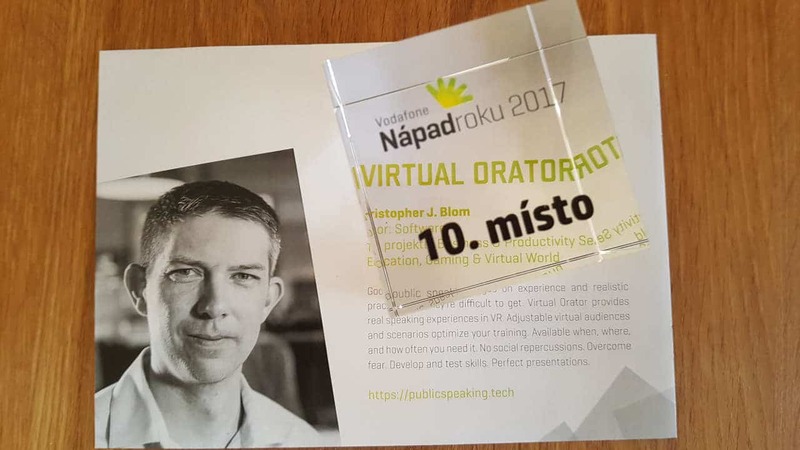 Applications like Virtual Orator are powerful when experienced in VR, but just images, words, even video are not the same. It was great to provide many of the mentors, jury and others with that experience of being in front of a crowd. As part of the competition, the Top 12 finalists had to prepare a 30 second video that was presented during the announcements. Again on a compressed time-frame. Here is our video with a small preface that wasn’t part of it. We thank the sponsors, jury, mentors, presenters, and our fellow competitors for making a great competition. We took away much more than a 10th place award from the competition and it was all of those groups and people that made it possible.